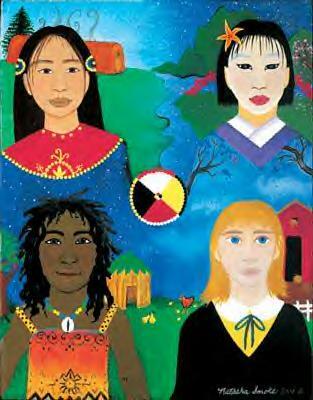 This project was birthed as a result of a meeting that came from devastation and emotion to compassion and determination between the Akwesasne Mohawak representatives of the International Children's Environmental Health Network and The Art Miles Mural Project. On September 11, 2001 as the tragedy began to unfold in New York, Pennsylvania and Washington, DC, The Grand Chief and Program Director for Wholistic Health and Wellness Program of Akwesase Mohawak Territories, Dr. Lee Thomas from the Akwesasne Mohawk Territories in Quebec, were in a workshop with The Art Miles Mural Project co-founders when they were interupted and asked to gather in the plenary room. Horrific scenes were on tv, as people were jumping out of the twin towers. Dr. Thomas, Joanne Tawfilis and Dr. Fouad Tawfilis found themselves consoling one another and after a lengthy session they began discussing the absolute need to stop the spiraling world violence and agreeing that it should begin with children. Further, Lee Thomas continued to share the philosopies of the 4 directions and that according to Mohawk's beliefs People must strive for Kken:nen, Peace, Ka'nikonhrir:io, A good mind, and Ka'shatstensera, Strength. She shared that among Indigenous Peoples everywhere, tha there is the agreement that the history of Indigenous Peoples of the World have in their respective histories, the teachings of Peace. It was here that the resolve was made to organize the first ever INDIGENOUS YOUTH Peace Summit under the official project of the Art Miles Mural Project, giving the proposed event a shared official standing as a UNESCO Decade of the Culture of Peace project. The entire organization and planning for this conference and the legacy of constructing and establishing A PEACE VILLAGE in the territories has been completely absorbed and seeded through the incredible collaboration among tribes and tribal leaders and members in the multi Indigenous Northeast Region. The leadership of the Mohawk Council of Akwesasne in Quebec, continue their planning and fund raising efforts with the leadership of Dr. Thomas and support from the World Center for Strategy and Policy/Art Miles Mural Project. This is a spin off and stand alone project involving the planned participation of several thousand youth who will come together from August 14-18, 2006. The theme of the Summit is "In the Spirit of Peace: Opportunities and Challenges of Youth for World Peace"
Although the conference is considered a sub project of the Art Miles Mural Project and thus part of the Decade of the Culture of Peace for Non Violence Among Children of the World, obtaining official letters of interest and support from individual UNESCO leaders continues to be a problem as letters and phone calls go unanswered because the issue continues to be pushed to "another person in charge". No one wants to take responsiblity for this in the UNESCO heirarchy. Funding then becomes a problem because without a "charter", local tribal nations/territories, Canadian government and other prospective funding sources may not see this as an official event. Although the Mohawk Council would like to see some financial support, they have on their own, raised a small amount of seed money. The role of the Art Miles Mural Project will be to raise funds as a result of the completion of the Indigenous Mural Mile, write grants and obtain sponsors and to organize income generation Decade events such as concerts, performances and other activities. Lack of an individual official of UNESCO point of contact. The first action to promote the culture of peace in the first half of the Decade was to initiate the idea and gain the support of the entire tribal territory in Quebec. This effort was successfully completed, with a special interest because it was these very tribal people who helped build the World Trade Center, and the tribal elders speak of a prophecy that since they are the home of the Peace Maker, it is in their legacy and has been prophesized that the Peace Maker shall walk again in this Decade. The tribal chiefs and councils organized and presented an official "Announcement and Launching" of the effort in the territories, informing and gaining support of aborginal and non-aboriginal youth, elders, child and youth institutions, federal and provincial governments, associations and advocacy groups and the academic community in and around the territories. The Conference Plan and Peace Village Concept has been coordinated, reviewed and is now published. Funding efforts have begun and a Fund Raising Plan from Art Miles is in development. A more specific collaborative funding mechanism will be in place shortly. Representative tribal Chiefs and members participated in and attended a September 11, 2002 Art Miles event at Columbia University, with a ceremonial Indigenous opening with Peace Ambassador Joseph Ruben Silverbird. An art exhibition is being organized by Akwesasne Artists for a traveling show between now and the conference. Tribal Nations around the world have begun to contact the organization requesting involvement and information. If you are not in the UN political heirarchy, it is difficult to obtain access to a real person. If the UN is to take this seriously, then a permanent staff person should be assigned. The Secretary General is a great and good man, and could advise some of his leadership to do some outreach and speak with, and LISTEN to some of the ancient ways of healing, management, environmental care, respect, honor and spirituality. It would be welcome if the Secretary General could have someone appointed to be the Honorary Grand Co-Chair of this conference. The Youth Village for Peace has the potential of being a resource that will extend continuing education oportunities in the areas of peace studies, Indigenous History, environmental education, wilderness survival, mutlitcultural and expressive arts and global peace education. The Youth Village for Peace will provide a fully integrated curriculum which will prepare Youth and Adults for democratic participation in a global society. The Youth Village for Peace will sponsor ongoing Peace events and provide the entire community with tools that facilitate concepts of stewardship of the natural world, participation in the community as a peacemaker, and the dissemination of Peace centered concepts.